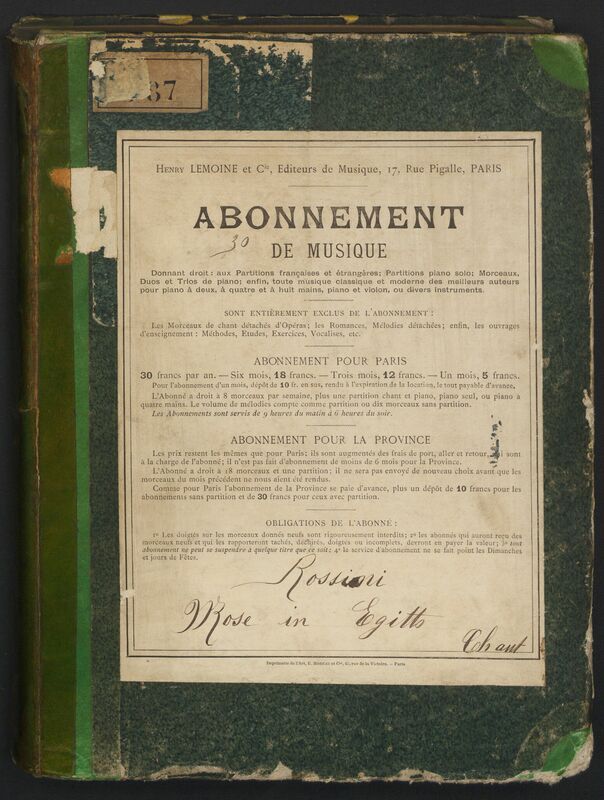 This set of recently digitized scores takes us to Paris of the late 1820s and 1830s to view the beginnings of grand opera as a genre, with spectacular works by Spontini, Auber, and Rossini. Along the way, we’ll take note of the signs these particular scores hold of their lives as objects, both commemorative and commodified. Spontini’s last major Parisian work premiered at the Opéra in 1819 to unfavorable reviews, and was withdrawn after only seven performances. As was typical of his compositional practice, he revised the opera extensively following its failed debut, replacing the first version’s tragic apotheosis with a triumphant, earthly coronation. After his move to Berlin in 1820, a German version was produced in 1821 at the Hofoper, with a libretto translated by E.T.A. Hoffmann. Further revisions followed, and a third, French version, reflected here, was revived at the Opéra in February of 1826. 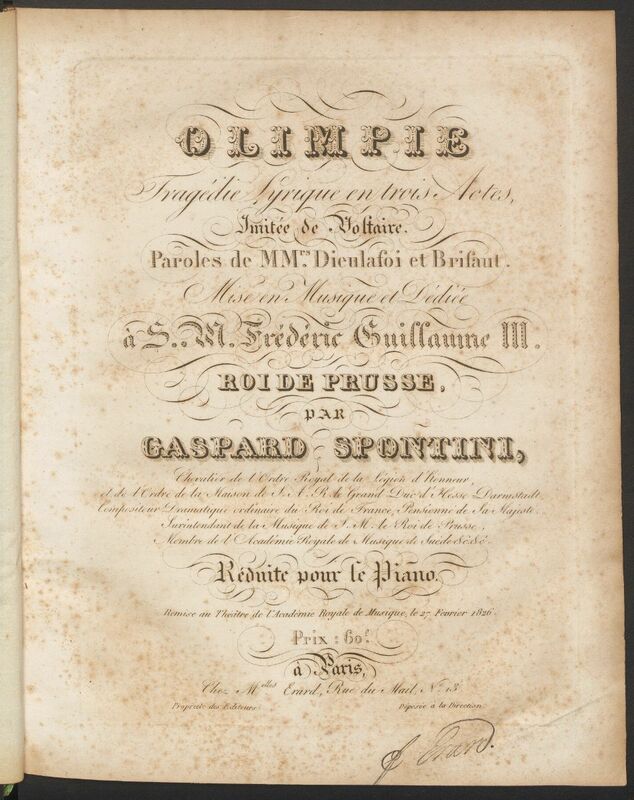 Olimpie : tragédie lyrique en trois actes / imitée de Voltaire ; paroles de MMr.s Dieulafoi et Brifaut ; mise en musique par Gaspard Spontini ; réduite pour le piano. Paris : Melles. Erard, [1827?]. 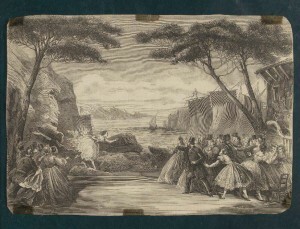 Auber’s La Muette de Portici, the prototypical grand opera, premiered in February of 1828 at the Opéra and received 500+ performances over the next decades. This copy includes a clipping from the November 29, 1862 issue of Le Monde Illustré, illustrating a dreadful onstage accident: Emma Livry, dancing the pantomime role of Fenella, was seriously burned when her costume brushed a gaslight and caught fire during a rehearsal. She died from her injuries eight months later, in July of 1863. Stage lighting was particularly dangerous for dancers, and similar accidents were not uncommon: while French law required costumes and props to be flame-retardant, many ballerinas, including Livry, objected to the way the chemicals stiffened their costumes. [Muette de Portici. Vocal score]. La muette de Portici : opéra en cinq actes avec accompt. de piano-forte / musique de D. F. E. Auber. [1st ed.] Paris : L. Troupenas, [1829?]. Rossini declined to produce Mosè in Egitto at the Théâtre Italien, revising it instead for the Opéra – with fewer arias and less extravagant vocal lines – as Moïse (1827). He composed only two more operas: Le comte Ory, a partial revision of his first Parisian work, 1825’s Il viaggio a Reims, and Guillaume Tell (1829), another landmark of the grand opera repertory. The first score of Mosè in Egitto shown was once part of an abonnement de musique, or music circulating library. These subscription libraries allowed the musical public to play through many more pieces of music than they could have afforded to buy, while publishers (and others) could run them as a side business. For a monthly or yearly fee, subscribers were permitted to borrow a number of scores per week: in this case, 8 pieces plus an operatic vocal score or piano arrangement. They were cautioned not to lose, damage, or write in the scores they borrowed, and at least in this case, the warnings appear to have worked fairly well. Although the binding shows obvious wear and the pages have some water damage, this edition from the early 1820s remained in good enough condition to be held by Lemoine & Cie.’s circulating library in the mid-1880s (date based on the company name and address). Mosè in Egitto : azione tragico-sacra / poesia del signor Andrea Leone Tottola ; musica del signor Gioachino [sic] Rossini ; ridotta per il cembalo dal signor F. Herold. Paris : Boieldieu jeune [1822?]. [Mosè in Egitto. Vocal score]Mosè in Egitto : oratorio in tre atti / posta in musica e ridotto per il piano forte da Rossini, le 25 Mai 1841. Paris : Marquerie Frères, 1841. Le comte Ory : opéra en deux actes avec accomp[agnamen]t de piano forte / musique de G. Rossini. Paris : E. Troupenas, [1828?]. Guillaume Tell : opera en quatre actes / paroles de MM. Jouy & Hypolite Bis ; musique de G. Rossini ; avec accompagnem[en]t de piano par L. Niedermeyer. [1st ed., 1st issue]. Paris : E. Troupenas, .